To comment on State Game Commission items visit our Proposals Under Consideration page. For opportunities to comment on Department plans visit the Public Comment page. Become a Wildlife Conservation Volunteer. View publications for the latest in print and PDFs, including Rules and Information booklets and New Mexico Wildlife magazine. Click Here for department-wide news, or view News categories from the main menu. Big-game draw results now available. Credit card refunds will be processed Monday April 22. Check refunds will be issued in the next 2-3 weeks. 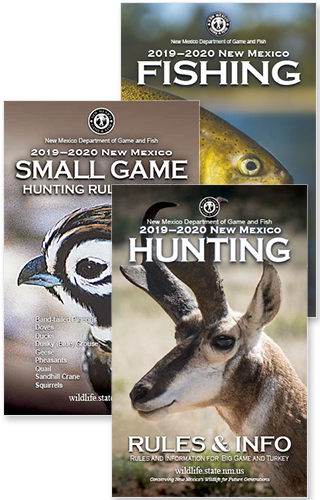 2019 game-hunting and game-hunting & fishing licenses purchased through the draw application now available in NMDGF accounts. Click My Purchases in the main menu of the Online Licensing System to print your license. A tag is required for big-game and turkey hunts, in addition to the printed license (unless the new E-Tag option is chosen for deer or elk). Do not hunt without a valid tag.